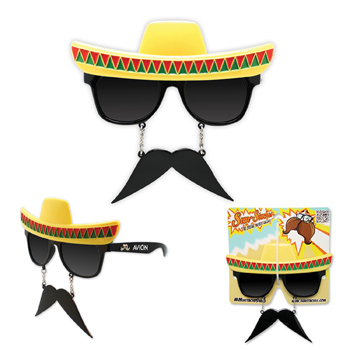 Sun-Staches®, as seen on Sharktank, are a new, fun style of eyewear! Perfect for veterans, recruiters, tradeshows, stadiums, Halloween, parties and more! 100% UV400 protection. One size fits most adults. Sun-Stache® comes in individual retail packaging. May contain branded Sun-Staches® stock imprint on inside of sunglass arms for brand authenticity. Sun-Stache® is a registered trademark of H2W. Imprint Size : 1 1/2" x 5/16"